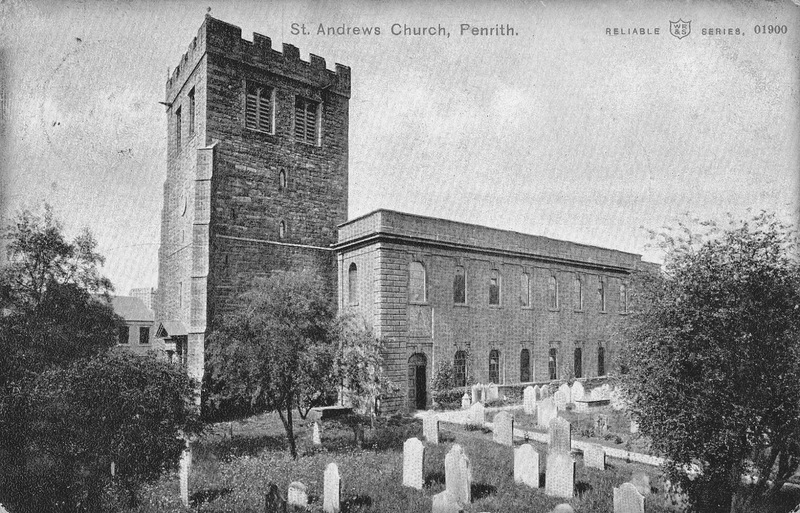 The church of St Andrew is situated at the junctions of Middle Gate and King Street just off the market place in Penrith. The church is surrounded by a mixture of modern and older buildings, some dating to the 1600’s. From the outside, the church looks fairly recent, and the tower’s looks certainly do not give away the fact that it is somewhere in the region of 620 years old!! Indeed, the main body of the church we see today dates from 1720 to 1722, when a major period of rebuilding was undertaken. The new building was probably built following designs laid down by Nicholas Hawksmoor. However…..the tower is the most interesting piece of this building. It’s believed that it dates from the 1300’s, and was possibly built as a place of refuge for the people of Penrith against Scottish incursions into the town. In 1337, the Scots raided south of the border, reaching as far as Carlisle. The city was surrounded and those parts outside of the secure walls were burnt. Rose Castle was severely damaged and huge swaithes of country side put to the sword and the flame. In 1342, the Scots raided south once again, this time reaching as far south as Gilsland and then Penrith. And, once again, they burnt nearly everything they came across. Three years later, Sir William Douglas led yet another Scottish army over the border, Penrith receiving the brunt of his army's willingness to lay waste to the countryside. Penrith was burnt again, and Douglas' army returned North with huge amounts of loot. In 1380, Penrith was once again the target for another Scottish incursion. This time though, the raid coincided with one of the town's fairs, and the population was therefore swelled. Many people were killed, and even more were probably taken hostage...an act common in these sorts of military incursions. It's not clear what role the tower of St Andrew's may have played in these dangerous times, but at least some of the town's inhabitants may have found refuge behind the huge thick walls. Above. 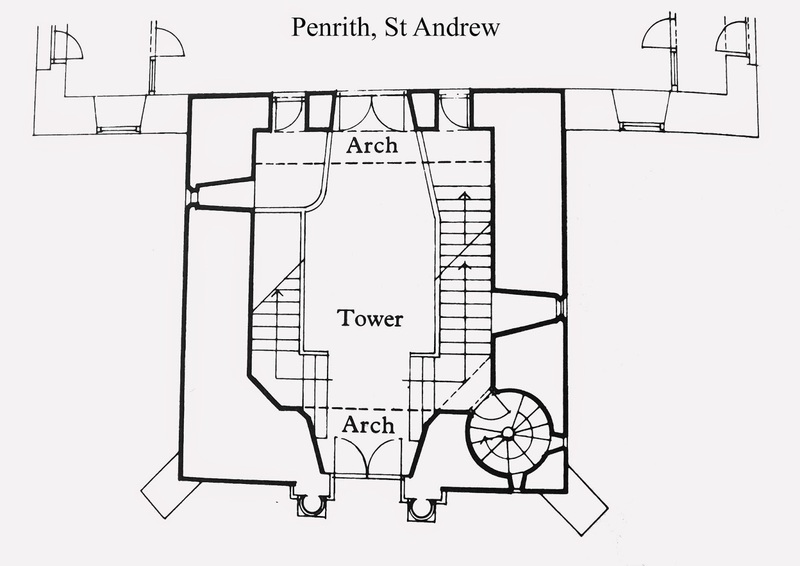 Floor plan of the tower. 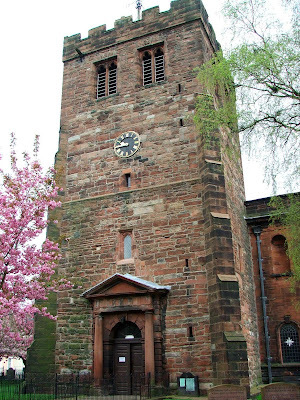 There is a possibility that the church tower was originally built specifically as a place of refuge, adjoined to an earlier church. Indeed some documents state that the townsfolk were ordered to make good the tower when it was found to be in a poor state of repair. 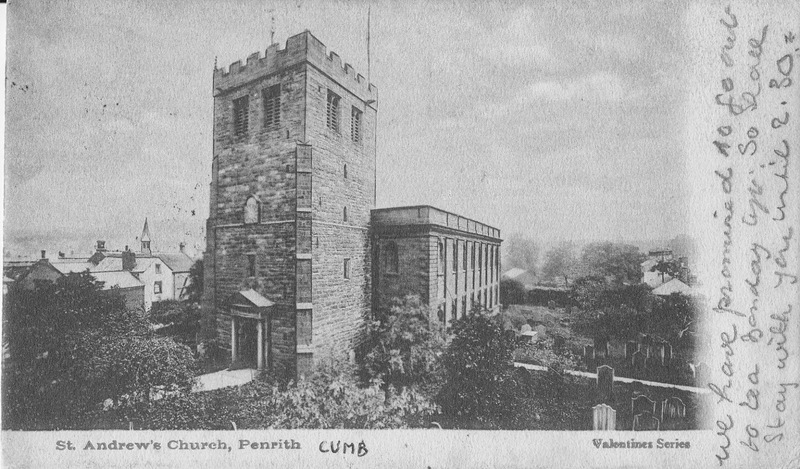 As the parish church of Penrith, the church most likely had a good peel of bells, which meant that the tower would, by necessity, have had thick walls to support the great weight of both bells and walls. This may account for the thickness of the walls, an character trait most often attributed to fortified buildings and towers. The body of the church is much more recent, as are the upper portions of the tower. The lower levels are original, and date from the earlier church, sometime in the early 1300s. The huge arch in the interior wall of the tower dates from the 18th century. Inside the tower, the thickness of the walls can be seen from the windows cut into the walls. The stair case is split in two, and runs either side of the interior. At the top are two stone effigies, very badly defaced. These represent members of the Hutton family, well known local land owners of the time. The church is open most days (although check for any services) and the open door policy is most welcome. Above. A couple of postcards showing St Andrews from my personal collection.